Welcome to Lucy Lemonade: A lifestyle blog—mostly about home DIY & decorating. Happy AUGUST! Wow, I can't believe how fast summer is flying by. And in sharp contrast, this project I'm about to share has taken a LOOOOOOOOOOOOOOOOOOOOOOOOOOOng. LONG. Time. But I have great news: It's finally finished! 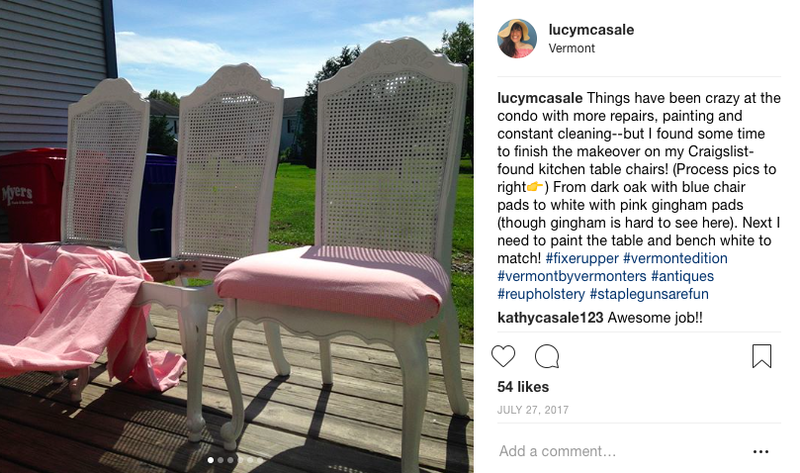 I've transformed my kitchen table (originally a $200 Craigslist purchase...a fair price for a table, a bench and four chairs) from boring and bland to Modern-Farmhouse-Style meets French-Country-Style. And I'm loving the results. Since the steps are pretty basic, I'll break it down in 3 PHASES. Buy a table you like. Try to find one with a bench if you're into modern farmhouse style decor! Of course, I wish I could just snag one of Joanna Gaines' buddy's modern farmhouse tables (hey Clint Harp! ), but a girl's gotta modern farmhouse however a girl can modern farmhouse...and Craigslist plus paint and elbow grease is the next best (and much cheaper) option. Still LOVE that red floor! Such a fun style choice on behalf of my landlord. And the table + bench I have always liked on my dining set, so they remain part of the picture today! Buy new chairs if you don't like the ones that came with your table. And either purchase cushions to fit them that you like (check out Home Goods!) 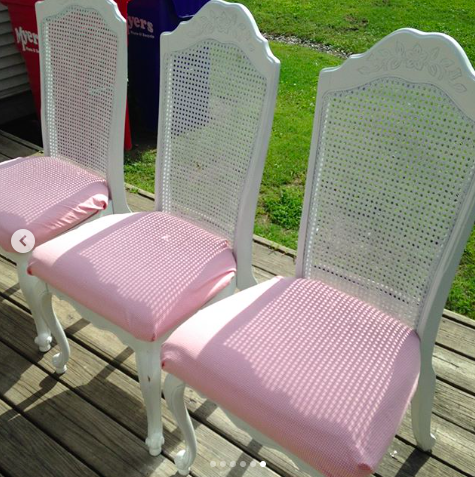 or, if they have built-in cushions, reupholster them in a fabric of your choice! 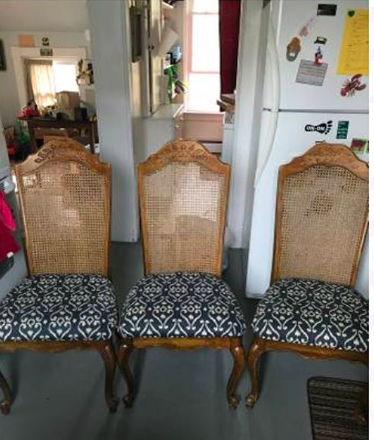 Original chairs. I loved the wide seats — very comfortable! 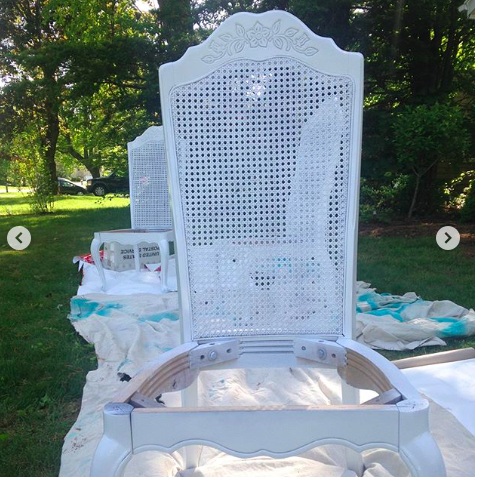 Painting these white (with glossy spray paint) really made the carved details POP! I like the flower detail on the top in particular. Before a blog...documenting DIY on Insta with progress shots. A note from current me to past me: "Get it girl!" Pink gingham cushions is what I ended up with —surprise, surprise! SUPPLIES! Here's what you're looking at: A sander, paint for the table, paint for the stencil...which I did NOT use but should have...stencil brushes, paint stick and my favorite paint brush, my white paint for the table and a polyurethane for the final coat. Here is the French Country table stencil I went with! I bought it from a stencil seller on Etsy! And here is my Modern Farmhouse style table painting project underway. First I sanded it down (see sander on the floor there). Then I just painted the legs and surround on the top. Below is a plastic drop cloth from the hardware store for $7. I will tell you: that's always $7 WELL SPENT since I'm not the most careful painter. I centered my stencil with a tape measure (always a classic move) and taped it down with painters' tape. TWO TRICKS IN ONE: (1) Cover your paint tray with plastic wrap before you put the paint in. It makes for super easy clean-up since you are just disposing of the plastic wrap! (2) Get out Q-Tips if you're going to stencil. This is a trick from my Mom of Infinite DIY Knowledge. You can clean up parts while the paint is still drying with the Q-Tips and obviously I used A BUNCH. Quick shot of my bench: my Mom made me this bench cushion (she can use a sewing machine! I can't!) and I love the French Ticking Stripes. I also have had this cute pillow for years, but funny enough it matches my table stencil! A final shot from one angle of my FINALLY FINISHED table set. Have you re-done your kitchen table? I'd love to hear how it went! Leave me a comment or send a message! Aug 27 DIY Farmhouse Laundry Room—In One Day!